HomeBlog Our Company has a Safety Management process because we want to ? Our Company has a Safety Management process because we want to ? 42% of respondents chose to reduce risk of death and injury as a key reason to implement a safety management process, while 32% felt it was for all reasons 1-3. 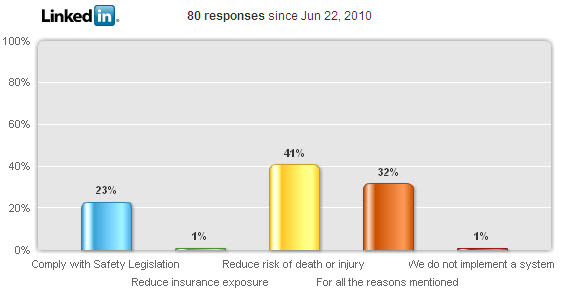 The desire to comply with safety legislation was selected by 22%c of respondent’s as the primary reason to for their safety management process. These results indicate that although legislation is a key driver in implementing an effective safety management process the basic personal safety of staff is the primary motivation in our poll.